Here, I put Pynthetica the Zen Master through a greater test for you to demonstrate how her interpretation of zen mastery wards off damage. “Chains of Flame” Heroic Elite is level 15, and so is Pyn. Obviously the layout of the fortress and the number of gnolls weighed heavily against my odds if I simply tried to run through the place alone. My tactics were simple: Stand and shoot. Only when champions showed up did I have to adjust my game a bit as they often had superior buffs, such as True Seeing, that penetrated one or more of my passive defenses. I subject Pyn to a hail of arrows and spell attacks intentionally in several places to demonstrate the effectiveness of her miss-chances, spell resistance, evasion and saves. Just watch the volume of miss miss dodge deflected dodge incorporeal miss incorporeal messages that scroll over Pyn’s head as she continues to attack. She deals far more damage than she receives when fighting from a distance, even with a horde of enemy archers. 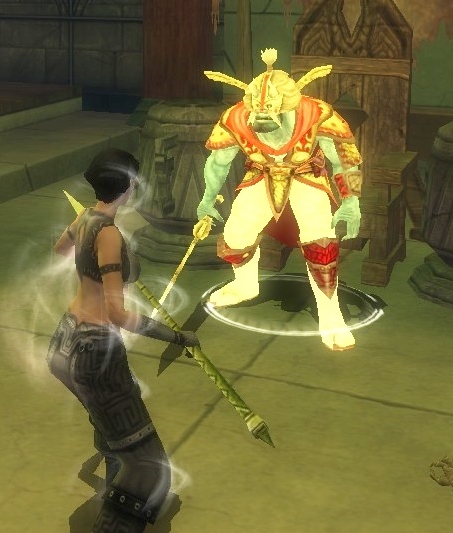 The video shows Pyn’s central weakness near the final path to the boss: Becoming uncentered. The Firebrand mages often threw spells that lowered my STR, leaving me overburdened and becoming uncentered. That turned off most of Pyn’s defensive powers, specifically my Dodge, Monk stance, and saves and the Incorporeality effect from the Ninja Spy Shadow Veil. Near the final battle I got too close to a group of mages that nearly took me down. In this video I summon Tempys the Cleric, but use him primarily to heal a few points if needed between battles as well as a mobile Death Ward clicky. Sometimes I just healed myself using Wholeness of Body every 2 minutes since I didn’t do a bad job at regenerating ki on my own. Tempys wasn’t allowed to fight throughout the adventure while I took advantage of distance to snipe the fortress dead. While I prefer to use an aggro-magnet for more confrontational battles using archers, “Chains” is large enough so that I could complete it without an attack dog. 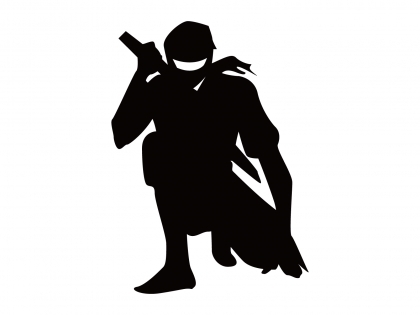 The Zen Master is also a ninja and uses their basic stealth techniques to sneak to places and set up assaults. I just need to wear more STR to offset ability-draining attacks. The video’s about 1 hour 10 minutes long. You can browse the video at time marks 1 minute 30 seconds, 18 minutes 20 seconds, and 48 minutes 25 seconds for specific examples of damage avoidance and deflection. The Arcane Archer Monk: Levels slower, less versatile than a Ranger, BIG Epic payoff. After my last post on a more viable Zen Archer, Sir Geoff of Hanna commented back, asking what a DEX-based Arcane Archer Monk would be like. And then light dawned again as I replied back. Going Elf, as with the Zen Archer, allows Dexterity-to-Damage, foregoing the need for any Ranger levels to get Bow Strength. It also resolves any weapon proficiency required for longbows for a Monk. You’ll need Zen Archery, of course, to Center the bow. The usual ranged feats are needed, starting with Point Blank Shot, Quick Draw, and Precise Shot, adding in Ten Thousand Stars as a class feat at level 6, Improved Critical: Ranged at level 12, Precision and Manyshot at levels 15 and 18. As an Epic character, you can add two more feats. You’d need to have 4 AP saved up to train the Arcane Archer tree from the Elf racial tree. But AP is where things get very, very tricky. I Canna Change T’ Laws O’ Physics, Captain! All of this training gives the basic Monk archer the required Dodge, Concealment, Incorporeality skills, Dodge, and, most importantly, every passive ki regeneration option from enhancements, gaining another +1 passive ki regeneration with level 12. Without it, a Monk archer wouldn’t have sufficient ki generated to power Ten Thousand Stars (20 ki) or Shadow Veil (15 ki) with any regularity. That leaves a paltry 38 AP. The elven Arcane Archer tree can eat up to 66 AP alone. You need 40 + 1 AP to train the last core ability. You’re 3 AP short. You can shave 3 AP from the Dodge cap increasing Agility without a sizable problem in defense, leaving you with just enough AP to complete the fifth core. And you might be able to remove 2 AP from Faster Sneaking. But Elven Arcane Archers level slower than their Ranger brethren. Your Heroic training won’t be completed until you’re a level 25 Epic character, holding back those 2 AP from your Heroic days until you reach levels 22 and 25 respectively, where the fourth and fifth core enhancements are available. But what AA training do you pick with only 41 AP? The monkcher builds use AA training, of course. Their multiclassing allows some class benefits that a single-class Monk doesn’t get automatically, particularly a larger spell point bar. So the AA tree has to first establish and improve spell point increases to empower imbuements or this build can’t do anything at all with too little SP. The goal of the AA Monk is to generate versatile damage combined with Monk defenses. While the monkcher leverages all kinds of classes and epic destinies, I envision the AA Monk as a more versatile strafing, kiting fighter–the complete opposite of the Zen Archer but with similar advantages because of full Monk class training. 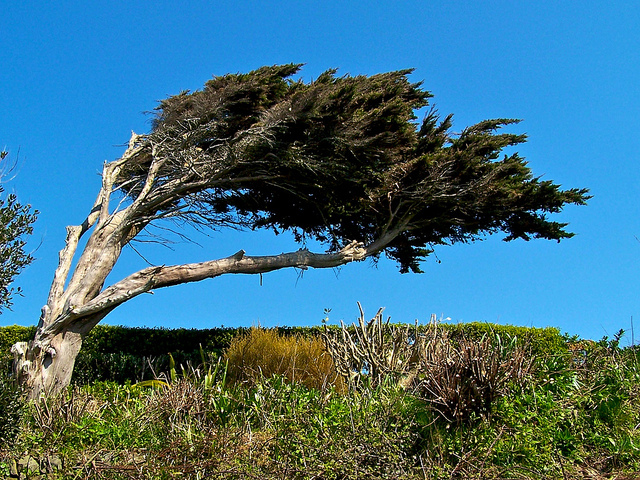 Arcane Archer: Core 1 requirement, 1 AP, to activate the tree. Energy of the Wild: 3 ranks, 3 AP. You gain Magical Training at 3 ranks to support passive SP regeneration with Echoes of Power and 80 spell points. We’ll skip Conjure Arrows, saving 2 AP. You can train enough with House Deneith to gain Sturdy arrows at 75% return. Elemental Arrows I: 2 AP. You need to spend AP to grow into the next tier, and taking at least one of these imbuements is wise. Morphic Arrows: Core 2 requirement, 1 AP. Elemental Arrows II: 2 AP. Force Arrows: 2 AP, rank 1. Terror Arrows: 2 AP, rank 1. Elemental Arrows III: 2 AP. Dexterity: 1 point to DEX, 2 AP. Training everything on this tier won’t get us to the next tier at 30 AP. We’ll need to back-train with a few AP as last time to spend 10 AP. Do note that training the tier requires character level 12, but we can’t train the fourth core ability, Aligned Arrows, until character level 15. Paralyzing Arrows: 3 AP, 3 ranks. Elemental Arrows IV: 2 AP. We still have a comparatively generous 11 AP left to spend. However, you’ll be stuck with 2 AP as you train as an Epic character, unable to unlock the last two cores until later. And you have to spend every point you have left, somewhere, leaving 2 points for Core 5 and 6. Arrow of Slaying: 2 AP. True Strike (Tier 1): 1 AP, 1 rank. Master of Imbuement (Core 6, level 25 required): 1 AP. I think so. It gains many benefits of the Zen Archer while gaining greater versatility with damage from the imbuements. This build is far less a flavor build as the Zen Archer, but its payoff is slower. But what this Elven Arcane Archer Monk really does well is Doubleshot. It gains 3% from Elven racial training, and 25% more from the Core 5 and 6 abilities. Then train in the Epic Destiny feat of Doubleshot for 10% more, and then add in an enhancement bonus from some weapon that likely will give up to 6%. That’s 44% sustained Doubleshot, friends. And I’m not adding in any Epic Destiny abilities. That’s probably a good thing, because we’ll blow our minds by imagining this character fully trained in the Divine Crusader destiny with Tier 5 ability, Celestial Champion (up to 10% more Doubleshot, if you can withstand getting critically hit enough times in a given period) and the last core ability, Zeal of the Righteous. That’s a toggled power-trip of decaying 50% bonus Doubleshot and 50 Ranged Power on top of that 44%. I was planning to have Artemistika the Ranger train as a Druid next. 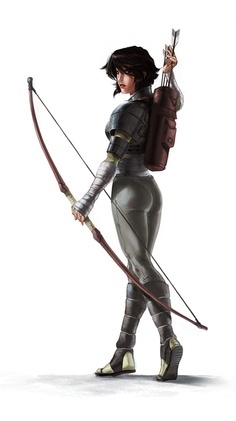 But with all of her many trained EDs, she may enter the convent and loiter in the archer’s glade training area for life #2. And I guess training yet another destiny, say, Divine Crusader, isn’t a bad idea now. Now that I’ve got a bead on character building in a formal way, thanks to forum member EllisDee’s Character Planner Lite, I will post a more detailed build later on the forums and in the Monk guide. For the first time ever, I’ve posted a build. It’s one of two I’ve genuinely created and not grafted from others. I think it’s going to be a fun flavor build for some that really enjoy the Monk. It’s no Shuricannon, but it’s proving great to play. 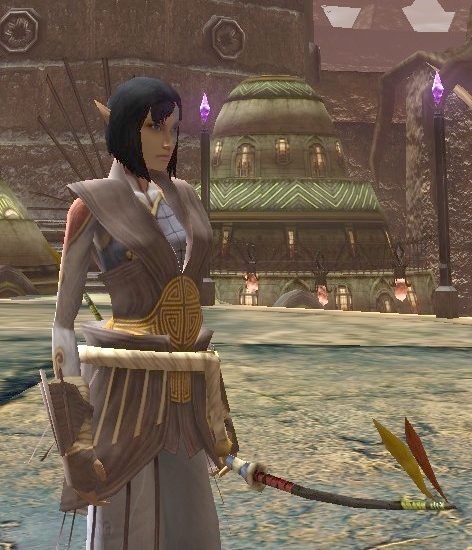 Feel free to read and comment about the Zen Archer here on the DDO forums. Update 25 has done something terrible with hireling behavior. Fixed a bug that could cause hirelings to switch back to “follow” mode shortly after a teleportation that was followed by a quick press of Stand Your Ground. But the results are worse than I’ve ever managed from our automated mercenaries, even taking personalities into account. Hirelings are now too passive. It’s like the old jokes that Johnny Carson did on The Tonight Show about Marlin Perkins, the host of the Mutual of Omaha’s Wild Kingdom TV show from the 70’s, where Marlin is parodied as sending out his sidekick to do the dirty work while Marlin watched in safety and comfort. Now, the hirelings are being pseudo-Marlin, treating our player characters as their hired help, and not stepping in properly as they should. When they’re set to Defensive mode, normally they will fight when an enemy comes too close. This often has the controllable but annoying side-effect of hirelings chasing down an enemy with a ranged attack, often aggroing a dungeon in the process. But when hirelings are now set to Aggressive mode, they will stand there, watching you as indifferently as a cat as you’re bludgeoned and beaten to a fruit-juicy pulp until you’re forced to hit their Attack button in order for them to pay attention and defend. Hirelings still get too personal about who they attack. Here I am getting pasted by something and the hireling, rather than attacking what’s immediately punching me, goes after something around the corner. Hirelings now have worse aggro definition than ever. The worse problem comes with buffs and healing. Like the Aggressive issue, hirelings are even less likely to drop what they’re doing to give you emergency healing and are even slower to resurrect you. The greatest example of something gone horribly twisted is the behavior of Flower and Larathor, two level 7 clerics. Where normally Flower’s personality is normally offensive when in Defensive mode, she’ll just look at you passively as your life is carved out of your body. Her summoned spider is still useful enough for the aggro-magnet it is, but not as much now, given that Flower doesn’t respond to its cries when under assault. Larathor is normally a hireling I avoid because he was too passive when I needed a fighting buffer, an light aggro shield mostly for ranged characters like my Zen Archers. But now, although he’s still enjoying watching you get beaten to an inch of your life and beyond when enemies are in close proximity, Larathor often jumps into the fray, rather than sitting out. Thankfully, the developers saw the cooldown conflict with the Call Hireling command and then telling them to Stand Your Ground, so movement control is much better. Always fight off melee attackers that come within a body length of them or their leader, especially if they are attacking their leader. Always prioritize threat to closest melee enemy, protecting Leader first, party members second. Never run to attack distant enemies that attack them or their leader unless directed to do so. Should recognize if they are being attacked from a distance and go into a new passive mode: Block, if Defensive mode is active and no other commands are being handled. They should stay in Block until commanded to do something else or if something comes too close to them or their leader or party. Should always heal (if a healing hireling) when leader is at 45% or less HP but never above 70%. This often causes wasteful use of spell points. Should have a prioritization of offensive spell use based on number of enemies, intensity of attack on the hireling or their leader, and spell cost. In short, a Cometfall is a bit excessive against one orc. Sir Geoff of Hanna has already praised the berserk nature of Larafay the level 15 Favored Soul. Now, she’s freakin’ insane and will manage to deplete her spell points in your quest’s first attacks faster than ever before. Should recognize and remove debuffing spells but prioritize such removals based on incoming commands. In short, don’t worry about my poison curse when I or another need a heal or revive. And always remove debuffs when no other commands are present and a party is not under threat. Once upon a time, at Update 20, a stealthy character could lure enemies hither and yon by cracking breakables close to them. See exhibit #1: A video of Kiricletica using this mechanic in “The Kobold’s New Ringleader” with Update 20. And the stealthy players and the devs saw that this was good. This meant that, if you shot an enemy’s buddy, he and his friends would notice and pursue you, no matter how far you were away when you shot them. This often caused a serious aggro problem because the enemies would often call for reinforcements though impossible sources, such as halfway across the a minotaur city, verging often into Dungeon Alert issues and the game performance issues that happen when dozens of enemies attack you at once. And, lo, the players lamented and were filled with rage–especially Assassins. It’s one thing to assassinate, but to broadcast it without the opportunity to escape detection of the fact, even with stealth and invisibility in effect, caused great anguish. And again, the masses were pleased. But it took me some time in gameplay, right into Update 24, to realize what the Developers did. As you know, Update 19 provided a revamp of the stealth mechanics in the game. It was, in my opinion, quite beneficial. Among other player adjustments (being able to jump, clearer rules on what Hide, Move Silently and invisibility did) monsters were given consistent rules to find you, and you as the player had a generally consistent options of hiding as well as escaping from them–with some study. No longer could monsters endlessly chase you. If you were able to break out of their line of sight and then go silent and out of view, the enemies would stop and search around the last spot they thought you were. After a time they may go back, or they might stick around to patrol your last revealed spot. No more “sliding” monsters. In related benefits, the Ninja Spies got upgraded enhancements that also helped them effectively “smoke bomb” a group, blinding and dazing them for 6 seconds to allow a window of escape. Flash Bangs are awesome. Either way, Update 19 made stealth operations, if not just the use of invisibility for some, far more consistent. But Update 22 swung the pendulum too far, and the devs wanted to correct it with Update 23’s change in what monsters tended to notice. The problem, as the Assassins and Rangers and many others learned, is that it was too easy–way too easy–for too many monsters to notice you and your party. As noted, sometimes the result was a Dungeon Alert as enemies began a cascading series of alerts to each other that activated much of the dungeonspace. Or, seriously weird reinforcements came out of nowhere. Some reported hellish behavior in “Frame Work,” where the chieftain’s call essentially aggroed the city, calling over every minotaur left into his tiny fortress against your much tinier party. So Update 23 revved back that monster-sense mechanic way back, so way back that ranging characters could once again, plug an enemy in the back and only attract the ire of that enemy most of the time. But in the course of that needed adjustment, the monsters became deaf. Not to players; you can still Sneak with a weak Hide or Move Silently and you’ll see enemy Spot check bonuses quickly escalate or the telltale red footfall blobs around your character that tell you that monsters can hear you coming. Monsters now no longer react to the sound of any objects breaking. Go ahead. Give it a try. Now, that same developer sorcery still allowed monsters to hear other items, such as Noisemaker traps and verbal spells being cast too closely to them. Monsters simply don’t hear vases, crates and barrels, even exploding ones, or other quest objects when they are destroyed. I’m not even sure if monsters react to the sound of broken doors now. Am I grousing about Update 23? Heck, no. I know the developers have to adjust the game mechanics to compensate the most common (albeit stupid) tendency for some players to treat every quest as if they entered Hazadil’s Warehouse (“Time to start smashing”) and broke everything they say without regard to the notion that breaking things create sound in most universes. So, without the adjustment to monsters overreacting to their allies, Assassins would continue to have a far harder time doing what they are designed to do. I only lament the loss of a crucial piece of the environment that worked great for stealth tactics. I would have really enjoyed using breakables to move about the large mobs that tend to congregate in corners and corridors in the latest super-dungeon, “Temple of Elemental Evil.” I would likely get a Devious bonus out of a place where there are thousands of things to kill. I did manage a Discreet bonus. But that’s just how I play. Stealth does not require (nor do quest objectives often allow you to express outright) pacifism. I’m already making some updates in the stealth guide.